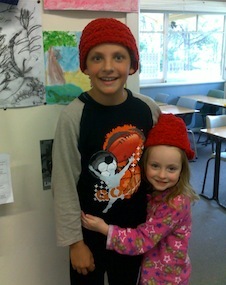 Pictured above: James and Ruby wearing their hand-made French-knitted beanies. Keia and Tom preparing to launch their rocket with bi-carbonate of soda and vinegar. Yanginanook is a multi-age school. This means that our students work altogether in the one classroom, rather than separated into specific year groups. 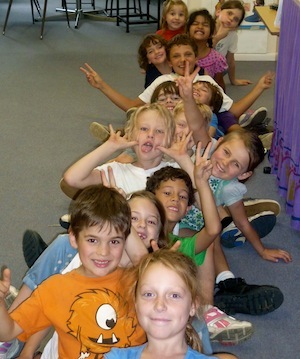 What are the benefits of the Yanginanook multi-age classroom? From Kindergarten, our students develop a love for learning and understand the importance of working both independently and cooperatively. This approach encourages children to want to take responsibility for their own learning and to work to the best of their ability, striving for personal excellence. Students complete schoolwork according to their ability, rather than their age. Learning activities are therefore targeted at the right level for each individual child. Children work through the curriculum at their own pace, often exceeding age-appropriate outcomes. Students work in a flexible environment, learning the vital skills required for self-direction, peer-tutoring and leadership. All students work together to become an important part of a respectful, hard-working and fun community. Younger students benefit from the helpful role models of the older students and are exposed to higher levels of learning. Older students take on important responsibilities and vital leadership roles, developing leadership and nurturing skills. They are given opportunities to share their knowledge and skills. All students play an important role in the school community and benefit from positive social interaction, respectful behaviours and increased self-esteem. Yanginanook has a no homework policy. Students spend a large portion of the day engaged in meaningful learning experiences and manage to cover the curriculum without additional pressures placed on the home environment. Yanginanook does not have a school uniform; however, students are expected to wear comfortable and sun-safe clothing (no singlet or sleeveless tops) and enclosed shoes. Parents are asked to purchase a 'Yanginanook' legionnaires hat that is worn by students when outside and when attending school excursions.